This photo was taken on April 8, 2015 at 3:13 AM. The location was on Rockville Pike in Rockville, Maryland. The "Take It!" 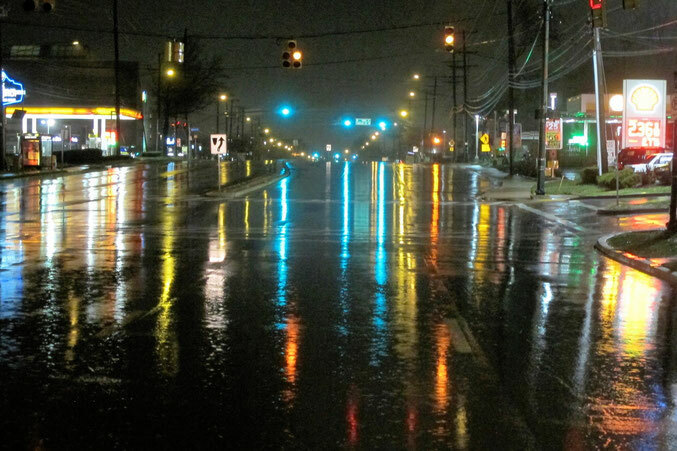 came from having looked at this great reflection of colors provided by rain, on this same stretch of road many times in the past. This time the road was almost empty of other vehicles which gave me a chance to preclude some dominance from either tail lights on the right or headlights on the left. What is shown is all a complementary inclusion of lights from either side or above the asphalt street which served as a wet canvas courtesy of the rain. The After Take: Everyone that I showed this photo too liked it for its simplicity of subject but also its complexity of content. The falling rain gave a sort of misting to the air which had an effect upon the picture to make it take on an appearance of having been painted. Rain brings magic in the right amount and havoc with too much. Each time the rain falls, I look for the magic that is revealed by the time of day I am out in it and am ever mindful of the hazards that this change in condition can bring. "Safe than Sorry" has become the slogan of choice as I move about in this ever so needed ( in the right amount ) condition. Let me encourage you to take another look at the street when it is raining and enjoy the splashes of color that both fixed and changing lights will bring to you. Please play it safe, we want you to be the one that opens that gift that we get with each new day. This is a great photo. The amount of color in this thing is just astonishing! This looks like it could be a painting. The city comes to life in a very different way in this picture. This is a cool photo. I just noticed the newsletter sign up on the home page and signed up for it. Teri mentioned that the newest picture looked like a painting. She said "go check it out and tell me if you agree". I'm sure she will be showing her husband when she gets home so I'll let her know here. Pretyt picture Bruce. I am also grateful to hear that you and my son play it safe out there in the rain. Look forward to meeting you in a few weeks. I am normally one for the nature shots but I can make an exception here. This is a gorgeous pic! Oddly enough when I look at this picture the Haddaway song plays in my head.... What is love? Baby don't hurt me, Don't hurt me no more. I'm not sure why. Anyone else getting that vibe? I immediately noticed the gas prices. Taylor told me they were cheaper in Maryland than they were in California. I didn't think the differential was that large, almost a dollar cheaper.